To me candy corn is as much part of the holiday Halloween as the ghost and witch are. Oh my goodness do I love those little pieces of candy that are meant to resemble the corn kernels that you would find on a corn cob. Growing up with grandparents that were farmers I have seen many a ear of corn and none with sweet pieces of candy on the cob so we wait each year to get that bag of candy corn at the same time each year. Try these cute little desserts that my group found not only super cute but also tasty. I hope you enjoy. Beat cream cheese in the bowl of an electric mixer until fully smooth. Slowly add powdered sugar, then milk (or cream). Add vanilla. Continue mixing. Beat about 1 minute on medium to medium-high speed. Fold cool whip into cream cheese mixture, and stir until fully combined. Scoop about 1/3 of the Cheesecake Mousse into a bowl, and color orange. Color another third of the mixture yellow. Leave the remaining third white. One color at a time (starting with yellow), scoop mixture into a piping bag or large Zip Lock bag, and squeeze a layer of the Cheesecake Mousse into small dessert dishes of your choice. Repeat with orange and then white Mousse. Refrigerate 30 minutes (or up to 1 day) before serving. Garnish with candy corn if desired. Sugar Free Option: In the past, I have adjusted this recipe to be sugar free, with good results. Simply substitute 1/3 cup Splenda for the powdered sugar, and replace regular cool whip with sugar free cool whip. 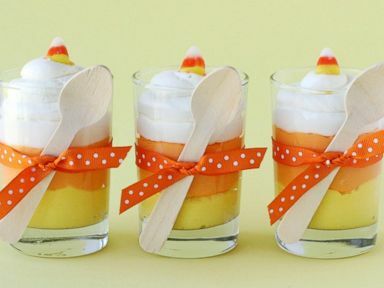 Omit candy corn garnish. Recipe options: This general concept could be created using vanilla pudding or white chocolate mousse (from a mix or from scratch). This healthy snack is just the right mix of spooky and fun and it couldn’t be easier to make. To prepare, just fill a serving bowl with your favorite vegetable dip. Wash and peel 4 long carrots for fingers and 1 medium carrot for a thumb. With a paring knife (a parent’s job), cut a flat, shallow notch in the tip of each carrot. Then use a dab of dip or softened cream cheese to glue a sliced-almond fingernail atop each notch. Stick the fingers in the dip, as shown, and serve with plenty of peeled baby carrots for dipping! As I mentioned we stopped by an area while visiting the Amish farmers who sell products to the public just like in the old days. At one place in particular there was a set of young brothers that were minding a pumpkin field they were such good farm hands and they were put in charge of selling and taking the money for the pumpkins. I had a great time and so did my grand-children picking out pumpkins and gourds that we would use to decorate our house and yard. It surprised me that there were so many different varieties and colors. My husband even commented I wonder how there are so many different shapes and colors. We ended up with a great variety and plan to cut jack o lanterns, paint a few pumpkins, roast some pumpkin seeds and have fun decorating as well. One of the best ways to decorate for fall for me is to use what is in nature. The dried twigs, pumpkins, gourds, as well as mums and other fall flowers. The pumpkins and gourds will carry through both the months of October and November as they will last quite a while if their skin is not cut. The smaller pumpkins and gourds and as I said there was a great variety of these are perfect for setting about inside as well, to use as place settings or to showcase in baskets or jars. There are a number of ways to make them work with the theme you may all ready have with the variety of colors and size available you may add twigs, berries or other items in with them to keep with the theme of your house as well as offer a bit of fall décor as well. The days have started to get shorter and the feel in the air is cooler that must mean that we are in autumn. The beauty that Autumn shares with us is one that can be expressed best to me by the term "Gods Coloring Book". As we took a road trip this weekend we were able to see the beauty in the leaves on trees and there were a few that were all ready standing there in the bare for all to see the limbs and bark that it had after shedding its leaves. The colors of reds, browns, yellows and still even some green and my grandchildren saw other colors that as adults we seemed to over look. As my grand-daughter saw purple in the leaves that were a deep crimson red and while she asked to catch a squirrel and take it home with us we assured her that the squirrels had a job to do in nature as well. The back roads we took that wound and went up and down and at times she said they were like being on a roller coaster took us through some of the prettiest territory back deep into the land that is shared with us by our Amish and Mennonite neighbors. The smells of nature and sights were did not even match the awesome scents that were offered there with the sweets in the bakery or the garden that hosted the fall flowers. All ready to be purchased and to take back home. This was something that we gladly did purchasing fresh baked donuts that kind that you have to hold with two hands because one hand even an adult hand can not master the size of these delicious donuts. The breads that we purchased smelled so awesome with so many choices and yet to say that the cookies we bought (we forgot to use for dessert) are still sitting ready to share with our family. We also met many smiling faces as we bought what they had to offer and I simply love to talk to my friends as their accent is one that reminds me of the old country. The children are all so helpful with one young man helping his parents by putting the bakery goods on the shelf and yet another set of young brothers helping to sell pumpkins for the family. The houses and yards are oh so charming with the simple white and neat oh so neat yards. If you ever have a chance to visit the back roads and our friends that live there take the time to do so it may just do your heart as well as it does ours.